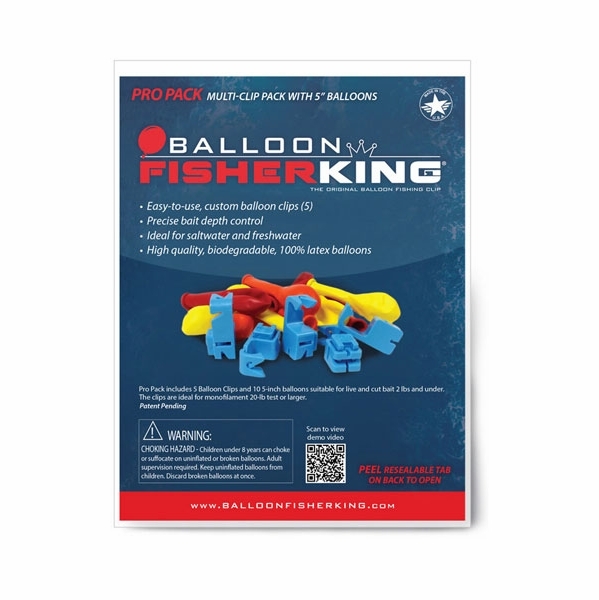 Pro Pack includes 5 Balloon Clips and 10 5-inch balloons suitable for live and cut bait 2 lbs and under. 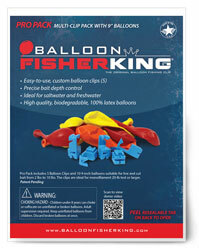 Pro Pack includes 5 Balloon Clips and 10 9-inch balloons suitable for live and cut bait 2 lbs and under. 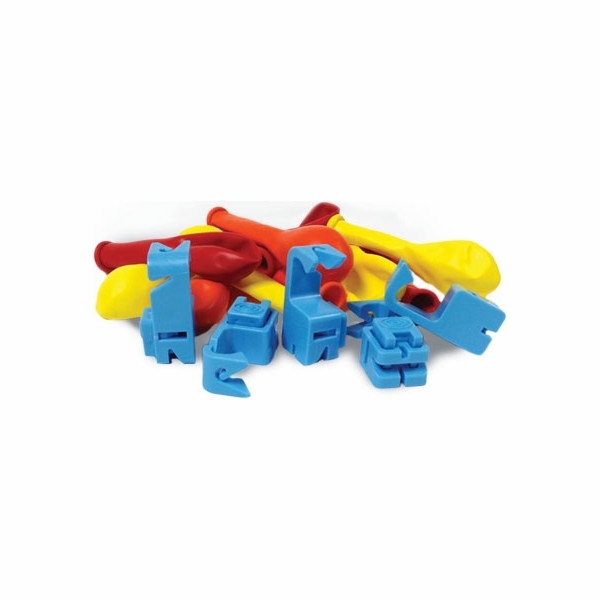 Starter Pack includes 1 Balloon Clip and 10 5-inch latex balloons suitable for live and cut bait 2 lbs and under. 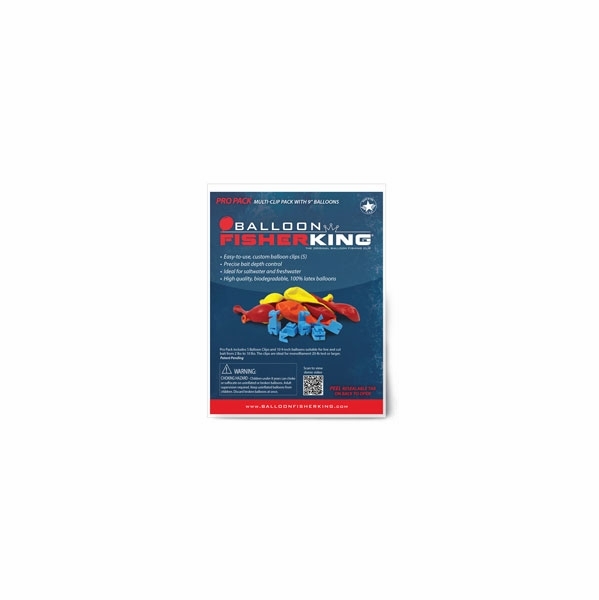 Refill pack includes 10 9-inch latex balloons best suited for live and cut bait from 2 lbs. to 10 lbs. 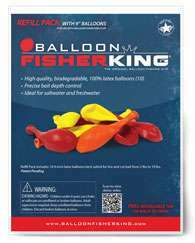 The Balloon Fisher King system was specifically designed to make balloon fishing faster, easier and far more effective than ever before! Balloon fishing is nothing new and has been around for years and used for saltwater, freshwater, offshore, nearshore, inshore, lake and river fishing. The intent is for a balloon to serve as a large bobber, suspending the live or cut bait near the surface of water. The balloon is usually attached to the fishing line via time-consuming, jury-rigged methods that include tying, rubber bands or swivels, among many other techniques. 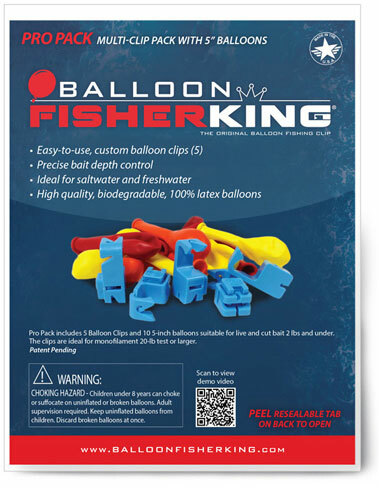 The Balloon Fisher King custom Balloon Clip is quick and easy to use and provides precise bait depth control. Balloon Fisher King uses only high quality, 100% natural, biodegradable latex balloons which are easier on the environment compared to inferior, synthetic party store balloons, which are commonly used for balloon fishing. Which Balloon size should you use? 5 inch balloons work best with baits under 2 pounds. 9 inch balloons are ideal for larger live or cut bait, from 2 to 10 pounds. 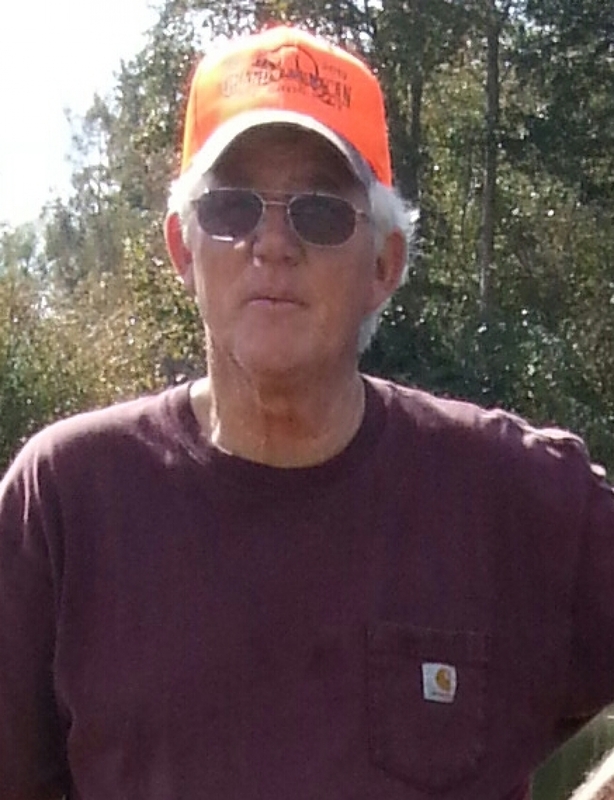 Clips are recommended for 20-lb monofilament or 30-lb braided line and higher. 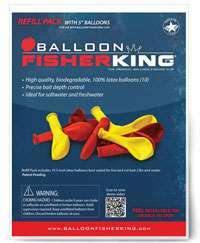 How To Use Balloon Fisher King - Just Clip, Inflate, Bait, And Fish! 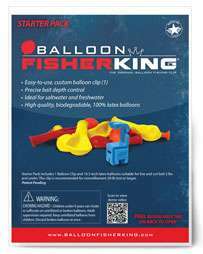 Balloon Fisher King is quick and easy to use. The patented balloon clip allows for rig attachment and removal in just seconds! Step 1: Attach the balloon clip to the fishing line depending on your desired bait depth setting. Push the button firmly on the side of the balloon clip. Insert the fishing line into the line cavity. Release the button to lock the fishing line into place. Step 2: Blow up the latex balloon and tie a knot at the neck. Step 3: Insert the balloon knot behind the notch on the side of the balloon clip. Stretch the balloon neck and insert all the way into the cavity at the top of the balloon clip. Step 4: Put on your bait and fish!